Thanks to the Internet many users have multiplied the size of their music libraries in hardly any time at all, and as a result of this, many of them have problems when it comes to managing their collection, due to the fact that in many cases the users don't even know how many music files that they have stored on the hard drive. Audio Comparer will help the user to find audio files that are duplicated on their hard drive. The application will scan all the songs that can be found in the folder indicated to the application in search of duplicated files. Before the analysis it will also offer the possibility to adjust the minimum threshold from which the program will start cataloging tracks. 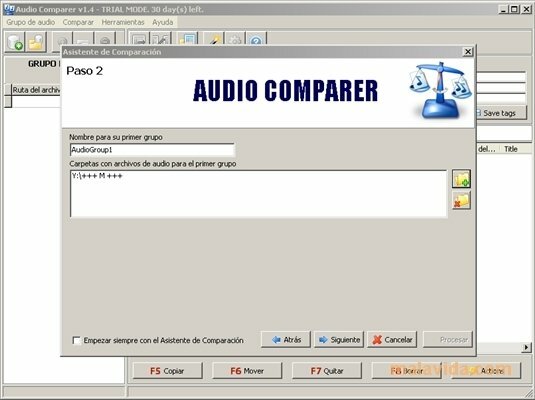 Once it has selected those songs that are duplicated, Audio Comparer will make it possible to listen to the tracks before they are compressed or eliminated from the system. It will also be possible to edit the ID3 tags to be able to identify or catalog each track separately. Keep your music collection free of duplicated files and keep all the tracks organized to be able to access the albums that you want, thanks to Audio Comparer.